Featured on the home page of CNN.com's "Don't Miss" health section this week is the inspiring story of a man who lost 245 pounds over the past two years through exercise and a vegan diet. 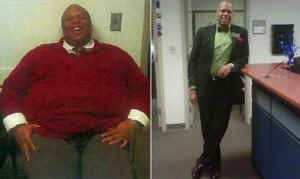 Marlon Gibson, a 34-year-old, 5-foot-11 Atlanta man, weighed his heaviest at over 400 pounds. He developed poor dietary habits from a young age, eating at McDonald's almost every day. When he made the decision two years ago to do something about his obesity, he decided to take the old-fashioned approach: diet and exercise. "I loved fried chicken, so I decided I would eat six pieces instead of eight," Gibson said. "Then I'd reduce it further to four pieces, and then eventually dropped fried chicken all together. I ate meat more like it was a protein condiment. Now I don't eat any meat at all. I'm a dedicated vegan." Not only has he lost more than half of his former weight, he no longer needs blood pressure medication and says he's "got energy for days." Marlon is just one of countless people who have become healthier on a vegan diet, and research shows that vegetarians and vegans have lower rates of heart disease and cancer, and consequently, live longer. Doctors have even cured chronic disease by prescribing a plant-based diet. Going veg is a great way to help shed some extra pounds, improve your overall health and help animals. Whether you gradually reduce your consumption of animal foods or go "cold turkey," there are lots of ways to go about it. Check out ChooseVeg.com for tips, recipes and resources on adopting a healthy and humane diet.